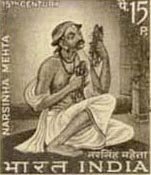 Vaishnav Jan to Tene Kahiye is the starting line of the famous and highly inspiring devotional hymn written by 15th century Gujarati poet and Saint Narasinha Mehta. 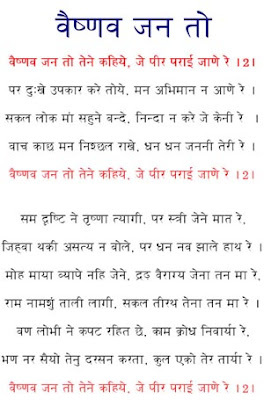 The song was popularized by Mahatma Gandhi and it was his favorite hymn. Gandhiji felt that the lyrics of this devotional hymn – sung at dawn and dusk in the houses in Gujarat in his days – carried the essence of Hindu philosophy. It communicated the gist of Sanatana Dharma in a language which could be easily understood by common man. This devotional hymn was translated into English by noted Indian author and columnist Mr. Khushwant Singh in a column written in the Hindustan Times. Blessed is the mother who gives birth to such a son. Nor covets another’s worldly goods. All places of pilgrimage are within him. Generations to come, of such a man, will attain salvation.